GSK and ViiV Healthcare said their two-drug human immunodeficiency virus (HIV) regimen -- dolutegravir (DTG) and lamivudine (3TC) – would change the conventional three-drug HIV regimen, in a news conference here Thursday. 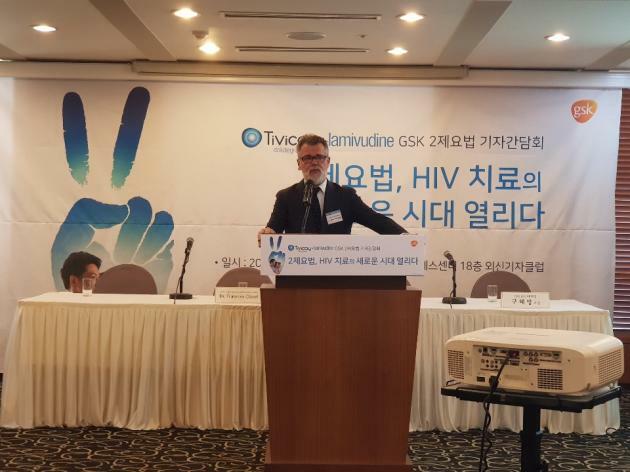 ViiV Healthcare’s Global Medical Director Francois Clavel explains the importance of changing HIV treatment from a three-drug regimen to a two-drug regimen during a news conference at the Korea Press Center in downtown Seoul, on Thursday. ViiV Healthcare is a joint venture of GlaxoSmithKline, Pfizer and Shionogi. Currently, standard HIV therapy consists of a three-drug regimen. However, through GSK’s global GEMINI 1 and 2 studies, which included more than 1400 HIV-1 infected adults, the company has confirmed the possibility of producing the same therapeutic effect with only two drugs with the same excellent efficacy and strong resistance profile. Also, HIV-infected individuals exposed to lifelong treatments can reduce the risk of potential drug toxicity through the two-drug regimen, Clavel added. The decrease in the number of pills does not mean that the treatment is less effective, she added. In the GEMINI study, the company assessed the safety and efficacy of the two-drug regimen of dolutegravir (DTG) and lamivudine (3TC) compared to a three-drug regimen of dolutegravir and two nucleoside reverse transcriptase inhibitors (NRTIs), tenofovir disoproxil fumarate/emtricitabine (TDF/FTC), in treatment-naive, HIV-1 infected adults with baseline viral loads up to 500,000 copies per milliliter. At the 48th week, the study showed 91 percent of the patients treated with the two-drug regimen achieved virological suppression, the standard of HIV management, compared to the 93 percent of patients in the three-drug regimen group. The results confirmed the similar efficacy of the two-drug regimen compared to the conventional treatment. When asked by Korea Biomedical Review if the company ever plans to decrease the drug intake to dolutegravir alone, Dr. Clavel noted that the company currently has no plans to use dolutegravir as a monotherapy. The Gemini study shows that result as it proves that patients who took a three-drug regimen can have the same therapeutic benefits while taking the two-drug regimen. Clavel added.